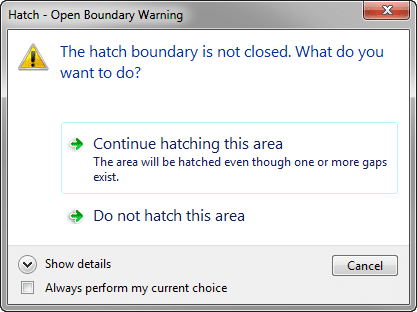 On any given day, you probably come across several instances where the area you need to hatch is open, and thereby disqualifies you from using the HATCH command until you add some temporary linework your drawing to “close” the area. The interesting this is it doesn’t have to be this way, as it is possible to hatch open areas using the lesser known “Gap Tolerance” function of the command. Typical room layout with door openings. In the above example I have a series of rooms I would like to hatch. As any good room should, each of these rooms has a door leading into them. To work around this, you could draw a temporary line to close the door opening, and then erase the line after you draw the hatch. Although this method works, it does add several steps to what should otherwise be a simple task of drawing a hatch. Start the HATCH command from the Draw panel of the Home Ribbon tab. Expand the Options panel on the contextual Hatch Creation Ribbon tab. Here you will find the Gap Tolerance slider. In my example I know my door openings are no more than 3’-0” wide, so I’ll set the Gap Tolerance to 3’-0”. 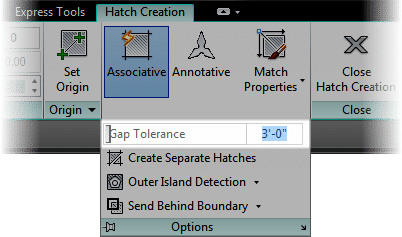 With the Gap Tolerance set, you can continue using the HATCH command as you would for closed areas. The only difference is that AutoCAD will warn you that the area you selected isn’t closed. Simply select Continue hatching this area to proceed with the hatch. By utilizing the Gap Tolerance setting I was able to hatch each of the offices in my floor plan even though the door opening made these open areas. awesome! hatch has always been the catalyst for most of my melt-down moments with cad. it either crashes your system or wont damn well hatch for one reason or another…..